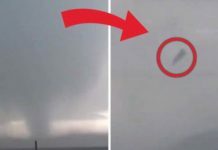 A line of strong thunderstorms on the wet side of Winter Storm Harper spun up several tornadoes in Mississippi, Alabama and Florida Saturday, including an EF2 tornado that caused extensive damage in Wetumpka, Alabama. First Baptist Church in Wetumpka, Alabama. 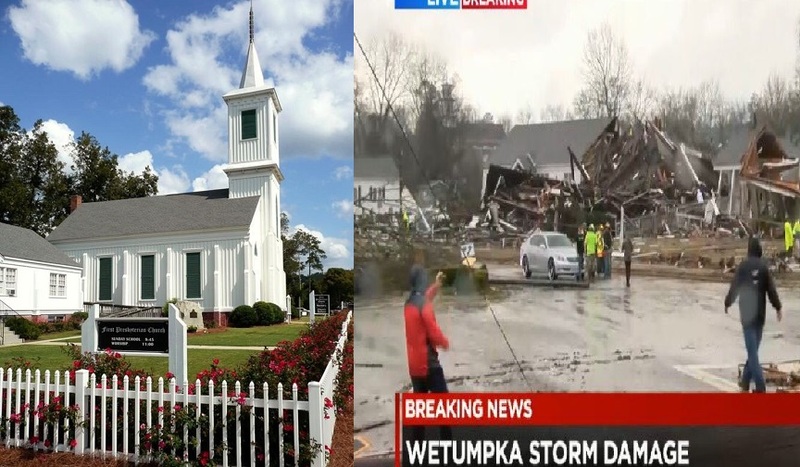 Reports on social media say the tornado brought down trees, damaged homes, destroyed a church and damaged the Wetumpka Police Department. Franklin said a curfew would be in place from 6 p.m. ET Saturday until 6 a.m. ET Sunday. 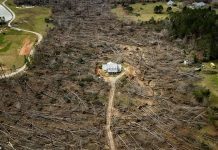 Earlier in the day, an EF0 tornado in Rankin County, Mississippi, knocked down several trees. A second EF1 tornado in Rankin County knocked down trees and power lines. Buildings on Tyndall Air Force Base in Florida were damaged by a possible tornado early Saturday evening, according to base officials. Tornadoes aren’t rare in January in the USA, but are mostly restricted to the South and lower Midwest states with just a hint of West Coast. The top five states for January tornado touchdowns are as follows: Texas (170); Florida (151); Mississippi (145); Louisiana (140); Arkansas (126). I had been searching the damage from the storm yesterday, but I could not find. I knew this storm should have created some damage because we had so much rain for more than 12 hours, and after that, we had strong wind. There was a tornado warning around Alabama. In North Alabama where I live, I could not find very much damage, but some damages might have been done. Just there is no report on the news. It looks like 2 historic church (Satanic churches) and (corrupt?) Police Station have been completely demolished. There is always reason to be happened. I guess this small town near the Alabama’s capitol city, Montgomery is a Reptilian dominant town to be wiped out by a secret Tornado created by Galactic Federation of Light. As I mentioned before, near Montgomery, there is a Reptilian area, Orion with Lockheed Martin facility. You can find many kid clothes and underwear spreading in some forest area. Those clothes belong to human children, being abducted by human disguised Reptilians, taken to their secret underground base for their consumption. Downtown Wetumpka received major tornado damage Saturday after a severe storm came through the River Region. One injury was reported by 4:30 p.m., said Mayor Jerry Willis. The injury wasn’t serious. The damage seems to be confined on the west side of the city along the Coosa River. First Baptist Church and First Presbyterian Church received “major” damage, he said. At least 25 homes are damaged or destroyed, and Wetumpka Police Station is heavily damaged. 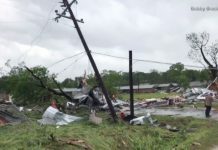 Willis was saddened but determined Saturday evening in the wake of the downtown portion of his city being heavily damaged by a possible tornado. “It’s bad, when you love a place as much as we love Wetumpka, to see this devastation,” he said. “We have worked so hard to get here and to see it destroyed like this. “We don’t know God’s plan, but we know he is in control. If this had been during the week with schools in session. If it had been Sunday morning with churches at worship, it would have been absolutely devastating as far as injuries and even fatalities. We’ll come back. We’ll clean up and come back.” Emergency crews from Millbrook, Prattville and Autauga County are offering assistance. Willis urges people to stay out of the area and allow crews to work. In the middle of the Winter, glacier is melting and sliding? It looks like mountain side village with white flower blooming on trees just like Spring. Mt Rainier got a new quake with depth only 0.2km. Magma is rising up to the brim of its caldera. It might erupt anytime and destroy whole populated Puget Sound area including Seattle and Tacoma. It might erupt even before the pending Great California Quake or Yellowstone blow up. You can see very active magma movement on this seismogram on Mt Rainier even today. When I lived in Bellevue while my ex-husband was working in the headquarter of Microsoft (That was more than 10 years ago. ), I visited Mt Rainier a couple of times. I got a strong impression this Mt Rainier would erupt quite soon. Mt Rainier is the time keeper for End Time around populated Puget Sound area. Look at today’s seismograms all over the world. The Earth is wobbling again! I tell you that the axis of the Earth has started shifting that makes the Earth wobble. Just like spinning a top, if the axis of a top moves, a top starts wobbling. I observed this phenomena in 2011. The pole of the Earth looked anytime shift. But somehow, it was stabilized. Do you remember Galactic Federation of Light had a plan to ascend the Earth by 2012? But it had been postponed. But this time, GFL might not postpone any longer. Thanks for all of these great links! You are welcome! And thank you for allowing me to share my findings. When the Government Shutdown has reached more than 30 days, it will be RIF = Reduction In Force. Today, it has already 30 days since the Shutdown has started. From Monday or Tuesday, Trump can start cutting unnecessary agencies and workers. His aim is to Drain The SWAMP. I guess his target will be so called “Shadow Government” such as FEMA, Department of Homeland Security, CIA, NSA, Department of Defense including US Air Force and some other military branches. Is he working with Putin? I guess so since he let US Government depart from NATO, the Reptilian military alliances. He also directed to retreat US military from Syria. That is the most Putin wants Trump to do. Trump has decided to drain the SWAMP where many nasty Reptilians are inhabited.